Watch the video below to start your journey into this hidden world ! in this series you will find that "golden ratio" which makes the spiral in the sunflowers seeds etc. The Fibonacci Series is very closely connected with another series called the "Harmonic Series" which is the basic building block of all musical sounds. If you compare the 2 sets of numbers you will see that the harmonic series really contains the entire Fibonacci series, and that all of the Fibonacci numbers are also pure harmonic overtones of the starting number in their series. Remember that both of these series can be started with any number, measurement or frequency. For example the harmonic series could be written as: 10-20-30-40-50-60-70-80-90-100-110-120-130 etc and the Fibonacci series as: 10-10-20-30-50-80-130 etc. On a piano the octave is exactly the same as the octave in the harmonic series, the fifth is also very close. Some of the other intervals are not exact though. Here is a video made with a micro-tunable guitar illustrating this very well, it shows harmonics 4, 5, 6 and 7. 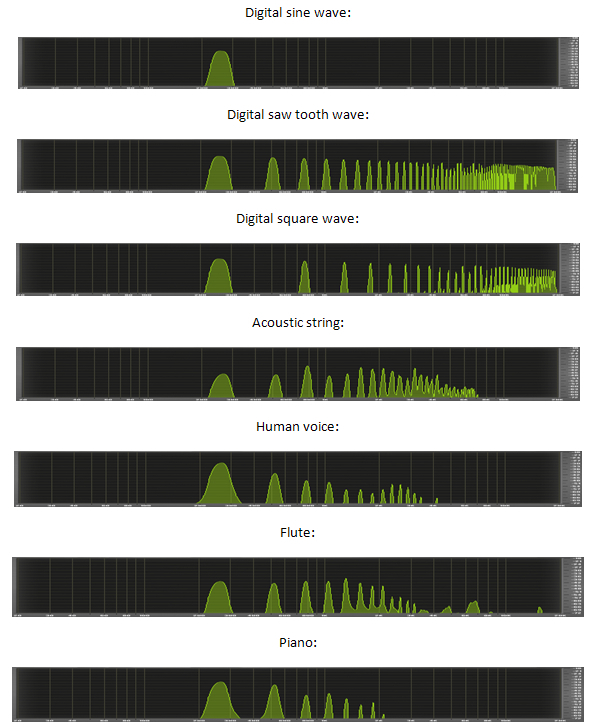 Below are some spectrum analyser images of the note C played with various commonly used musical sounds. The tone on the far left is the main fundamental frequency of C while the higher tones to the right are its harmonic overtones. You can see that the intervals between the harmonics are the same but that the volumes are different, it is these variations in the volume of each overtone that make each instrument sound unique. If you play a higher or lower note on the same instrument then the whole structure simply moves to the left or right (on the spectrum analyser). This is because the intervals between the harmonics are fixed and never change in relation to the fundamental frequency. The fundamental frequency and all of the over tones are a type of sound called a sine wave, this is the only type of sound that has no overtones of it's own. Without these intervals the sound will just be a noise, for it to be a musical tone it needs to have this exact arrangement of overtones that you see mirrored in all of the sounds above. Some sounds like certain stringed instruments can distort the harmonic series slightly making the intervals a bit too big, while other sounds like bells and gamelans have there own strange and completely unique overtones not in this "classic" overtone series. Many metallic sounds can actually be called "out of tune" and not "proper" musical sounds in relation to the 12 tone scales that we use in the west. Any producer who has tried to tune a church bell sample to their music will know that it can be hard. If you tune the root note of the bell to match your track, you will often find that a loud higher harmonic is a bit off. Tune the harmonic to match your track and the root note goes out of tune. The following video explains how bridges collapse due to harmonic resonance. In it you can clearly see the bridge wobbling at 1/2 or one octave of the length of the middle part of the bridge. Sound however is the best way to experience and so truly understand how harmonics work. This is because sound is vibration that is within the human hearing range, and so it can be perceived and experienced directly. A good place to hear the harmonic series is in the sound of a mono-chord or overtone chanting, both of these sound generation methods amplify the harmonics of the fundamental pitch so that you can hear them as a very familiar melody. Mathematically the harmonic series is full of interesting patterns. Below is an image that shows you the harmonic series for 9 (starting the series with 9 instead of 1) and the sum for calculating it, you can replace 9 with any number to calculate its harmonic series in the same way. The pattern on the right only happens with 9 though. Another way to calculate the harmonic series is to add the first frequency (9 in this case) to itself and then to keep adding it to your answer over and over again. So for 9 it would simply be 9 + 9 = 18, 18 + 9 = 27, 27 + 9 = 36… a very similar formula to the Fibonacci series. ​All of the intervals that we use in music can be found between the harmonics in the harmonic series. While equal temperament does not have the perfect ratios found in the harmonic series, it's intervals are based on them and do sound just about the same. The chart below shows the number of degrees found in each regular polygon and the flower of life when all of their angles are added together, as you can see sacred geometry and the harmonic overtone series are really one and the same. ​How this works: An equilateral triangle has 60 degrees in each corner, so 60 x 3 = 180 degrees. A square has 90 degrees in each corner, so 90 x 4 = 360 degrees and so on. This is not to say that 180 Hz is somehow the same as a triangle or 360 Hz the same as a circle, because they are not. What is interesting here is that the relationships between the degrees of each shape somehow make musical sense. If you look at the harmonic numbers on the left of the chart below and compare it to the harmonics 1 to 7 chart above, you can see what I mean. It does not stop here, if you use the above shapes to make the Platonic solids, and add all of their angles together, you also get harmonics of 180 Hz, only higher ones. Maybe this is because all of these shapes are equal / harmonic divisions of a circle (full circle = 360 degrees and half a circle = 180 degrees). Remember that all harmonics of 360 Hz are also harmonics of 180 Hz, while every second harmonic of 180 Hz is a harmonic of 360 Hz. In the following music video, you can hear the numbers in the regular polygons and the flower of life as sound frequencies. In this way you can hear that sacred geometry really is "frozen harmonics". The Pythagorean theorem states that 2 squared + 3 squared = 5 squared. If you raise this by a few octaves it is still accurate: 192 squared + 256 squared = 320 squared. 192 Hz, 256 Hz and 320 Hz make up a pure inverted major chord... 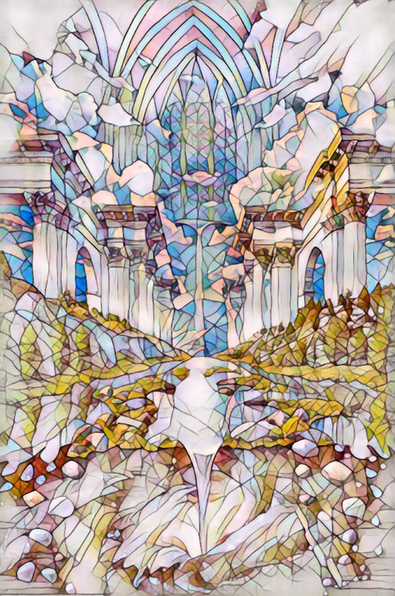 This harmony extends throughout the geometric world, with perfect shapes and angles almost always being connected to good musical intervals. When you see a cymatics video of metal plate with sand or water being vibrated with sound, you will see that amazing patterns are made by certain frequencies. If the frequency is swept upwards, the patterns will jump out at certain points. These get more complex with higher frequencies and simpler with lower ones. It is important to remember that the patterns do not happen with certain frequencies because they are special, they happen because those frequencies and the same as the root pitch and harmonics of the plate or drop of water itself. If you were to hit a metal plate or use a violin bow on it from various angles, you would be able to make it ring these same tones. So to really understand cymatics you need to remove the vibrating plate, as its size and shape influence the patterns in the sand or water too much. The short video below called “Shape oscillation of a levitated drop in an acoustic ﬁeld” is the purest form of cymatics I have seen. In this video they have taken a transducer and aimed it at a reflector so that the sound bounces back at it. This creates a standing wave with pockets of high and low air pressure that are fixed in place and don’t move at all. When this happens you can place small objects or drops of water in these pockets and they will float in the air! This is good for cymatics, as now you only need to worry about the resonant frequency of the water drop itself, and not its container as well. In the video they play the fundamental frequency of the drop of water, and it flattens into a disk. Then they play the second harmonic (octave) of this pitch and it becomes elongated, like a sausage. This sausage, however, is oscillating. The ends move together and the sides move apart, forming new ends so that it was like a “plus symbol” but with only one line visible at a time, at the peak of each oscillation. When they play the third harmonic the water forms a triangle, also oscillating with another one so that both together would be a Star of David, but only one was fully formed at a time. And so they go on. Each harmonic’s shape has the same amount of sides as its sequence number; 1 = circle, 2 = sausage, 3 = triangle, 4 = square, 5 = pentagon and so on. Obviously cymatics made using metal plates and other objects are just showing you complex versions of these basic shapes, made so by the extra factors being brought in by the objects’ physical properties. Here is some music that was made using a VST synthesizer called "Omnisphere 2". It uses single note recordings of real sounds that you can then play across the whole keyboard, it can also have each individual note adjusted to exact Hz frequencies and so can play any scale that you like. In this music each note has been re-tuned to play harmonics 16 to 32 (repeated over octaves). The voice sounds are real human voices with nice natural harmonics, you can hear these harmonics ringing like bells and playing "ghost" melodies that are perfectly in tune with the actual chords and melodies. Having the intervals between the notes exactly the same as the intervals between the overtones inside each note really works. Tuning music like this creates fractal harmonies and "sonic geometry" that seems to have a very calming and balancing effect on people. While this does work with normal equal temperament tuning, it is not nearly as accurate or as powerful as with proper harmonic tuning. Another type of scale made from the harmonic series is called a "just intonation" scale, just intonation scales are made using ratios of a single reference pitch or root frequency. These ratios actually represent the spaces found between harmonics in the harmonic series. If you do not understand how ratios work, I will explain them in a simple way: The ratio for D in the next chart is 9/8, this means that the frequency for D is the root frequency (C) multiplied by 9 and divided by 8, all the ratios in the scale work in the same way just with different numbers.​ 9/8 is also the interval found between the 8th and 9th harmonics in the harmonic series. When talking ratios you don't need to specify the Hz frequencies, a person using the ratios can decide for themselves what frequency to use as a root (unison / perfect prime in chart below). Then they can use the ratios to calculate the rest of the frequencies from that one. The scale below is a good example of a ratio based just intonation scale. If you want to try this scale, click the image below, follow the link to my facebook group and look under "files". Ratios with small numbers always sound better than ones with larger numbers (a ratio of 6/5 sounds better than one of 11/8). This is why the sweetest just intonation scales are made with smallest possible ratios. Small ratios sound better because they represent spaces between harmonics that are closer to the fundamental of the harmonic series. You can find the true "harmonic series position" of any interval in the above chart by finding the two numbers in it's ratio in the harmonic series chart below. This chart is arranged with octaves side by side because everything in the harmonic series repeats over octaves. Now it is easy to see that ratios like 3/2, 6/4 and 12/8 all represent the same interval. This means that even though 12/8 is higher up the series than 7/5, it is still a better sounding interval. So this harmonic law is a bit more complex than just "good intervals near to the root and bad ones further away". This is because all octaves of the root frequency (perfect prime) are more harmonic with it than any other harmonics are. Even though these octaves extend right to the "end" of the infinite and endless harmonic series. Similarly, all octaves of the fifth of the root are not as harmonic with it as as it's octaves are. but are more harmonic than any other intervals found higher in the series. ​This rule reveals the harmonic order of all ratio based intervals: The 2/1 octave is the most harmonic, then the 3/2 fifth, then the 4/3 fourth, then then 5/4 major third, then the 6/5 minor third and so on. Things get less linear after the sixth harmonic, where you will find dissonant harmonics like the 7th, 11th and 13th harmonics among good sounding ones. See Music is math and Geometry, Music and Mathematics to delve deeper into this. ​All music really originates from the harmonic series, even the normal 12 tone equal temperament scale was derived from the above ratios. So even with "normal" music, the basic intervals (octave, fifth, fourth, major and minor third) still follow the same "order of harmoniousness". This fact was known as far back as ancient Greece, where the octave, fifth and fourth were considered to be the best intervals of all. It can be applied to all aspects of music, including song structure, poly-rhythms, key changes and order of notes in a melody. This is why psytrance is mostly has straight 4/4 timing, with 3/4 triplets coming in second, 5/4 third being quite rare. It even effects the timbre of sounds, where sounds with louder harmonics up to the sixth harmonic and softer ones above it sound rich and warm, while sounds with louder harmonics above the sixth sound harsh and metallic. If you find this interesting, you are not alone. People have been studying the harmonic series for thousands of years, and they never got bored because it really does seem be everywhere and in everything. In the end it really is true that things like geometry and vibration are not as different or separate as most people think they are. If you want to know more about all of this , I would recommend reading "Mathemagical Music Production​".​​ It dives deep into this subject, and includes tutorials for applying this universal information to modern day music production. With this book in your studio, using this timeless mathematical "map" as a basis for your production is really easy to do.